Every student benefits from a rich and diverse group of teachers. Almost 50% of public school enrollment in the United States is comprised of non-white students. The minority is quickly becoming the majority, and yet teachers of color make up less than 20% of all teachers in classrooms across the country. A healthy school is intentionally diverse in the faculty, staff, and administration. In addition to reflecting racial diversity, a healthy school embraces an intersectional point of view. This means that your school actively embraces and supports racial, religious, gender, age, ability, ethnic, socioeconomic, and sexual identity. Students thrive when they are taught and mentored by teachers who have diverse backgrounds. They gain a better sense of the world when diversity is a part of their lived experience. Even in schools with majority-white populations, research shows that white students benefit from learning from teachers of color. 1. Commit to learning about teachers of color. We are all learners when it comes to embracing an intersectional mindset. Think Progress reports that a whopping 80% of principals are white. This means there is a learning curve that most principals will have to commit to in order to do this work. To hire teachers of color, educate yourself on the experiences of these teachers in the classroom. Mary Dilworth’s excellent book Millennial Teachers of Color is a great jumping off point for learning more about the unique experiences of these colleagues. In her book, she offers relevant ways to support this cohort of teachers. In addition, there is an excellent network of teachers of color who tweet using the hashtag #EduColor. Follow the hashtag to gain varied perspective about the experiences of diverse classroom teachers. Consider following some Twitter-teacher superstars who are at the forefront of conversations about equity and inclusion. They include Jose Vilson (@theJLV), Sabrina Joy Stevens (@realsabijoy), and Ileana Jimenez (@feministteacher). 2. Make attracting teachers of color a team effort. You can also make your hiring committee even better by learning together about the ways in which schools can close the achievement gap. This starts by making sure that students of color have the chance to be taught by people who look like them. By doing a bit of extra legwork together, you improve your chance of making a better hire. 3. Use external resources to create diversity in your staff. Connecting with local universities and building a relationship with teacher-training programs can provide a fruitful way to recruit more teachers of color. If you can create opportunities for student-teachers in your building, it’s possible to have early access to excellent candidates. Some schools have seen success with a “grow your own” strategy that introduces high school students to the teaching profession early. There are excellent Grow Your Own organizations across the country that have successfully attracted and trained exceptional teachers of color who have made impacts in classrooms all over the country. 4. Be aware of invisible labor. Many teachers of color leave the profession because they are often given extra roles and responsibilities because of their race. It’s exhausting to be the go-to person for questions and issues about race on campus. Being asked again and again to work on committees and lead initiatives around equity and inclusion takes its toll on a teacher who already has the many other responsibilities. However, it can be hard to say no to those opportunities because they are important to evolving school culture. They’re also vital to those students. Your teachers of color have likely taken on the mentoring and emotional triage for students of color in your building. This is the essential work that makes teaching rewarding. However, it’s important that as a principal, you recognize that it can be emotionally taxing. You can be supportive by acknowledging the invisible labor they do. Also, think twice before asking too often for their presence on committees and PLCs. 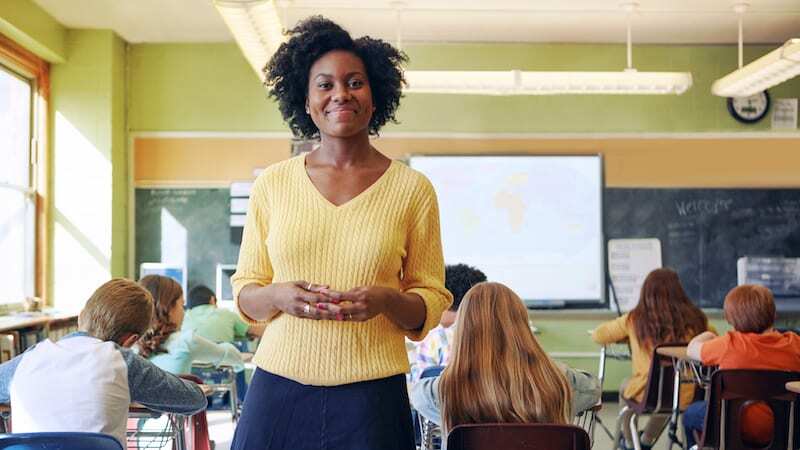 If you have teachers of color doing significant work outside the classroom, consider making that work a formal part of their yearly evaluation with appropriate compensation. You can be a leader when it comes to attracting and retaining teachers of color. However, this is not an easy task, and it takes time to build better practices in a school community. And yet, this is essential work. Your commitment to making your school inclusive sends a powerful message to students and families. When you provide your students with a diverse teaching body, you can change deeply held perceptions about what is possible. You are also creating a richer, stronger learning environment for all of your students to thrive in. Plus check out this article.